Good Morning Wyrdos, I made a couple faction-specific tape measures that I wanted to share. The faction logos are cold-cast bronze weathered w/ washes and shoe polish, then sealed w/ matte varnish. The tape measures are just little chrome-plated ABS Stanley ones. I used fine steel wool on the Gremlins, and 600 grit wet/dry sandpaper on Guild to knock down the shine. Thanks for looking. Merris and her booze powered rocket taking off. My gremlin take of Wyrd science, since really anything gremlins do is wyrd. Does anyone else need music in the background when they're painting or playing? I do. So I made this Malifaux playlist, months ago. Thought I'd share it with the group. Had a situation tonight which confused me and an opponent regarding a Bayou Gremlin's Whoops, Ricochet trigger going off. I read that models can see in any direction at any time. The Gremlin in question was within LOS to 3 friendly models, depending on how you say he was facing. Obviously he's shooting a particular direction - is that what you use to determine what model is in LOS for the Whoops, Ricochet? Or are any of the three models fair game? (Two were beside him, one a little above, one a little below, with Somer quite far above him, call it North, but still within range.) For purposes of our intro game I thought the most logical course was for Somer to be the friendly target, as he was in the direction I'd been trying ot get the Gremlin to fire. But I wanted to see how it is supposed to actually play out for future reference. Thanks in advance for any help! Anyone have any oddball lists that you take for specific matchups and/or strats/schemes? I am definitely not talking about a take all comers list, but rather any full rosters that are built around executing a specific game plan. My entry for Round One of the 2016 Iron Painter. It's based on the idea that there's always one dude in the gym who is bad enough to wear a pink tank top to work out in, and he is NOT someone you want to mess with. Hope you enjoy! Hi all Just found my old gremlin models from M1.5E during a recent clear out so decided to grab the M2E rules and the first gremlin deck of cards so that I could start playing again. I've pretty much forgotten what models I had and lost the cards but I know I had the Ophelia box from way back. I've added a picture but it's not the best for identifying them. I didn't play all that much before in all honesty. I'm busy reading the rules and just signed up here to say Hi. With all the 'new' stuff out are there any 'must have' inclusions for an Ophelia crew these days? Please bear in mind that to me 'new' stuff is anything past around the start of M1.5E !!!!!! Hello my fellow bayou residents! I recently got my first few crews for malifaux. Neverborn ( lynch) and gremlins ( Ophelia) now im itching to expand my available modles. 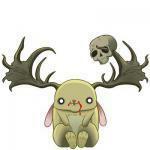 So what are models I should look into getting for gremlins? I already plan to get slop haulers, and am very heavily considering the Som'er crew box. Mostly to have Lenny, but also to maybe play Som'er. Speaking of Som'er I guess most people play him as a summoner and just try to abuse dumb luck everywhere? I have some interest in Gracie and maybe Burt Jebsen, but not sure. Also with Som'er's crew what are good expansion for that? I plan to use a lot of the Lacroix ( love them so much) but figured they could easily play into each other for crew options. Anyway im just rambling at this point, but thanks in advance for any help. Expanding soon with Wong, looking for recommendations. Hello all, as the title suggests, I'm looking to expand my Bayou presence here soon, and I'm looking for more experienced recommendations to aid me in my nefarious, green-skinned plans. Currently, I have the "Closing Time" Brewmaster box, Burt, Trixie, Nurses I'm turning into "bar serving girl" slop haulers, a whiskey golem, and a lot of Arcanists, which I mention for merc-Performer purposes. My next step is to get Wong's box and Gracie for sure. Also thinking about Sammy & Merris. I know I'll get them eventually, just not sure if they should be an immediate purchase or if I should wait. So what would you recommend beyond that to work well with one or both of those crew boxes, and why? Piglets? Stuffed Piglets? Bayou Gremlins? What crew boxes would you suggest after Wong? What are your thoughts concerning Sammy & Merris? Lay it on me! I found some Goblin miniature, and converted him to make Old Cranky. Just thought I would share. We just started a campaign with the new rules and last game this question arise. Is it possible to use the Bayou Two Card ability for Finished Off-flips or is the relevant model already considered dead and as such it's abilities out of play? Burt jebsen has slippery that when targeted by an attack action, he may pick another target within 2. Vendetta reads, if noted models frist attack is against noted model, in this case burt, score 1 vp. How does that resolve? Is burt no longer the target or is he still "targeted" and i get my 1 point? So I'm rather curious why humans get all of the gremliny copy-cat attention. 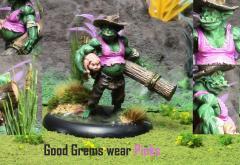 The fluff states that after humans arrived in Malifaux the gremlins started to mimic their farming practice to try and take over their pigs, develop moonshine, and fire boomguns. But haven't Neverborn been around for at least as long as the Gremlins? Aside from Sammy imitating Zoraida, why aren't there other green versions of Neverborn stuff? An easy answer is that Neverborn have a malleable appearance, and only look the way they do now because of the presence of humans. But we also know that Black Blood can be implanted (or is maybe even infectious? ), so it's still possible for there to be an acid-blood goblin. Similarly, they love to get intoxicated, so there are likely some gremlin Illuminated/Depleted floating around (though I totally get not making a model for that as it would span 3 factions). In addition to that, it's also rather interesting that the gremlins seem to be immune to the necromantic voices that seem to seep into human minds in Malifaux. I know there are people who want a gremlin Resurrectionist, but I think it could be a cool plot point that gremlins cannot hear those secrets. Any thoughts? Or perhaps stories which I don't know of which go into some of these details? Who do you take Lucky against? So I just finished up my lucky effigy and am bummed that he's more of a side grade (different role) to a BG rather than an upgrade despite costing a stone more. He has his place with brewie forcing WP tests and Ophelia because she flips so many cards, but who do you take him AGAINST. My immediate thought is ressers because they are going to force more flips w/ HtW etc., and they also have lower than average Df possibly making his Ml attack viable. Also his higher Wp might help set him apart with all those terror duels, and he could even stand up to a belles lure with the benifit of liquid bravery. So what say you? Any other insight with him is appreciated as well because I'm pretty bummed about him not having many use cases. So i'm getting The Brewmaster crew for Xmas and while i'm seeing how the crew works though their entries in the core book i'm sure i'm missing something with fingers... He stacks poison really well for the upcoming paralyse or brewmaster tarpit but is there something else other than the chatty and scheme marker manipulation that makes him worth 10ss? So what's up with Wong? Sorry if this is already a thread, I saw there was that one about Wong up fairly high, but I think most threads revolve around actually using models in game and their crew building. I'm more curious about his story, or what he's doing. It's a fairly open question, but I'm just curious what he's about, or from whence he came? He clearly uses magic, but how did that come about? My other more broad curiosity is about Faction X Arcanist crossovers, namely the notion that anything that can cast spells might be related to Arcanist. Is this how people generally view the Arcanist Faction, as the primary "Casters"? The alternative, that I subscribe to (Which better explains why Wong would not be Arcanist), is that Arcanist happen to be comprised of many mages, but represent more of an ideal or mentality, a group bound more by shared interest than vestment in the arcane. Does this seem reasonable, or is there a good reason Wong could be theoretically clumped into Arcanist? I'm just curious what the defining trait why or why not a model might be partially woven into the Arcanist (Other than purely that being their design), and the general story around Wong and any connection he has to magic or the Arcanist (Does he like them, hate them?). Thanks for the know how, half-stock-green-kin. So, if you sacrifice a Stuffed Piglet to the Pigapult's "Bacon Load", is there any way to avoid the "Stuffed with Explosives" ability, or do you just have to suffer the -1 to shooting in exchange for tasty, tasty blasts?